Berlin is a constant source of inspiration for the new and the changing – a nurturing place for the process of innovative and alternative ecosystems. The culture room seeks to reflect and present a city that always has been, and still is, in flux and transient, a city that thrives on its movements. Through its constant yearning for movement, Berlin has become a city in the forefront of alternative ecosystems, nurturing not only the new systems themselves but also the makers of them. With old systems in place, all new beginnings start from a clean slate, allowing for it to grow with a process in mind. With its season the growth starts from fresh every spring, bringing a sense of newness, fresh opportunities, and inspiration. This is echoed in the nature of Berlin. Why a movement room on a hackathon? People at a hackathon come together to discover and to develop something new. They work in small teams. But they only have 3 days to get to know each other and to create together. The movement room is a safe environment to support the work in the teams in an energetic way. We meet to discover how can we enter each other spaces and connect with other people — through movement or dance. We are interested in the question: What happens if all these people start to move and activate different areas in their body — how much more creative will their work be? Does it have an effect on them? How do people who are not coming from a dancing/moving background feel to open up in a movement room? How do they accept it? The freedom room is an alternate reality where the participants will learn about its meaning on their own, in the very moment they enter. It follows the values of the decentralization movement and is there to have participants connect with them, in their own unique ways. It is an opportunity for participants to be confronted with an emptiness that encourages inward reflection and discovery of a source of inspiration within themselves. Participants will be made aware that they can enter the room at their own free will, and are kindly requested to leave the room as they found it. Euan Williams- Installation – Flat to Form, 2018: When blank, A4 paper has a ubiquity, uniformity and a sterility that is wonderful. When confronted with it you can’t make an impression upon it. You need to fold it; mark it with a pen. The room is filled with 20,000 little sculptures. The work describes a simple and formal transformation of a flat surface to a form. An increasing of volume. To screw up a piece of paper into a ball is a sculptural act. Each ball is unique. It fits into the hand of who balled it. Every edge and ridge of the paper balls can fit into one another like rudimentary Lego bricks. Placed on top of one another they can be stacked into large mounds and towers creating a larger landscape. Imagine a computer game without a music. A movie without sound. Inspiring creativity through music can be pivotal when brainstorming for your hackathon project. Exposing the hackers to the emotions and vibrations that music can bring, consequently can become a method to push novel ideas into action. Pierre Burel will introduce you to the world of building instruments with unconventional materials. Simon Schmidt will show you how to “hack” and create your own loop station through code and controllers. Nicholas Bamberger will amuse you with his seductive piano improvisation. Limboski will open your heart with sarcastic love songs. Stephen Paul Taylor is there to make sure that in every situation there’s a place for an underground party. Some may say nature is at odds with the environments we create with technology. We see that nature is an integral element to incubate ideas. After all, inspiration is shaped by our environment. The concept for the nature room is to acknowledge how organic matter shapes our input for creating new technology and to incorporate the surrounding natural elements of Berlin to enhance the overall experience of the hackathon. All of the plants and nature represented in this space are locally sourced. We invite everyone to take time in the nature room to use all of your senses and take inspiration from all elements of nature. Conversely, we ask you to evolve the nature room and take these elements with you throughout your experience this weekend. The Culture Room is a welcoming space designed to facilitate inspiration, enabling collaborators to innovate in an environment that exists solely for that purpose. Havven is a project-focused payment engine that enables payments within and between blockchain platforms. Our payment engine offers protection from volatility while remaining decentralized and scalable. 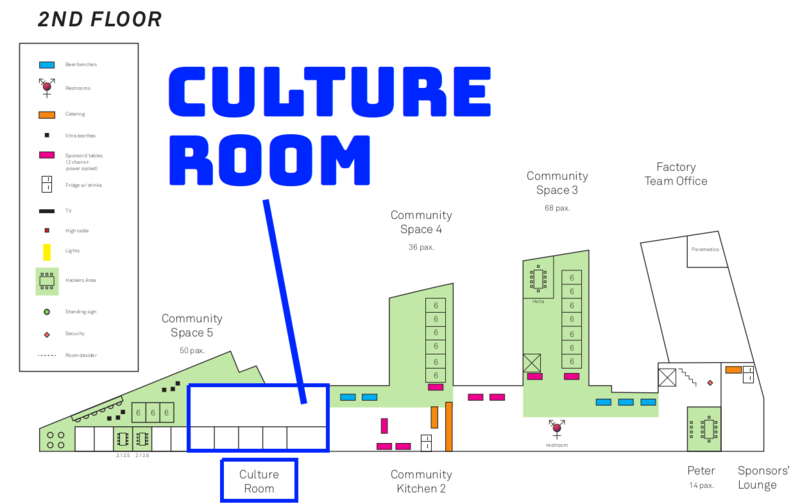 The Culture Room will provide a sanctuary of productivity away from the hustle of the rest of the event. An idea is only as good as the individual/s who possess it, and we believe the Culture Room will enable creators to do what they do best.